Why an international forum on migration statistics? 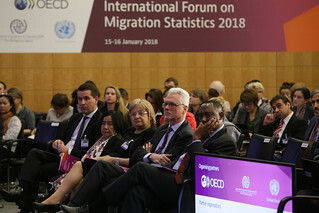 In this context, the OECD, IOM and UNDESA jointly organised the first International Forum on Migration Statistics. This is aimed at becoming a regular event that will contribute to intensify the exchange of information, to promote mutual learning and to facilitate cooperation among relevant stakeholders. It brought together all producers, analysts and users of migration statistics in a community of interest centred on migration measurement issues. It mobilised expertise from a wide range of disciplines - such as political science, economics, demography, development, geospatial science, sociology, statistics, and information technology - that can contribute to improve global understanding of the migration phenomenon.